Pneumonia - body, last, viral, contagious, causes, What Is Pneumonia? Pneumonia (nu-MO-nyah) is an inflammation of the lungs, usually caused by infection, that can result in breathing difficulty. When a person breathes, air enters the lungs and travels through millions of tiny sacs. These sacs, known as alveoli (al-VEE-o-lye), are where oxygen is transferred to the blood, which carries it to all parts of the body. When someone has pneumonia, the lung tissue becomes inflamed and the alveoli fill with mucus * and other debris, making it difficult for oxygen to be transferred. When normal amounts of oxygen cannot reach the body's cells, many symptoms may develop. Bacteria or viruses usually cause pneumonia. In some cases, a virus may directly cause the disease. Also, viral infections that lead to respiratory symptoms (such as those of a common cold) often produce inflammation and mucus buildup that makes it easier for bacteria to take hold and infect the lungs. Fungi or parasites are less common causes of pneumonia. Chemicals, drugs, or radiation also can cause lung inflammation. Aspiration (as-puh-RAY-shun) pneumonia occurs when someone accidentally inhales food or vomited material into the lungs. Pneumonia is a common infection among people who are hospitalized for something else. Such hospital-acquired infections are especially widespread among people recovering from surgery and those who are placed on breathing machines (ventilators). Hospital-acquired pneumonia is almost always bacterial and is often caused by strains * of bacteria that are resistant to many antibiotics. For this reason, and because it affects people who are already sick, hospital-acquired pneumonia is more frequently serious or fatal compared to cases of pneumonia acquired outside the hospital. What Are Some Different Types of Pneumonia? * intestines are the muscular tubes that food posses through during digestion after it exits the stomach. * croup (KROOP) is an infection involving the trachea (windpipe) and larynx (voicebox) that typically occurs in childhood. It causes inflammation and narrowing of the upper airway, sometimes making it difficult to breathe. The characteristic symptom is a barking cough. Fungal pneumonia usually targets people with weakened immune systems. For instance, pneumonia caused by Pneumocystis carinii (nu-mo-SIS-tis kah-RIH-nee-eye), which was recently identified as a fungus, is most common in patients with compromised immune systems, particularly those who have AIDS * . Other fungal infections that can involve the lungs include histoplasmosis (his-toh-plaz-MO-sis), blastomycosis (blas-toh-my-KO-sis), coccidioidomycosis (kok-sih-dee-oyd-o-my-KO-sis), and aspergillosis (as-per-jih-LO-sis). Pneumonia was a leading cause of death in the United States in the early decades of the twentieth century. With the help of antibiotics, it dropped to number five by 2000. Although that is certainly an improvement, the disease is still common enough to affect between 3 and 5 million people each year in the United States, with more than 60,000 deaths annually. The bacteria and viruses that cause pneumonia can pass from person to person. When people who are infected sneeze, cough, laugh, or talk, they expel bacteria or viruses into the air in tiny drops of moisture that can be breathed in by others. The germs also can contaminate surfaces that an infected person touches, such as doorknobs, desks, and keyboards. If people do not wash their hands after touching these things, they could become infected by casually touching their eyes, mouth, or nose. An infection contracted this way can lead to pneumonia, although it usually does not. * AIDS , or acquired immunodeficiency syndrome (ih-myoo-no-dih-FIH-shen-see), is an infection that severely weakens the immune system: it is caused by the human immunodeficiency virus (HIV). Sir William Osler, often called the father of modern medicine, spent much of his life studying pulmonary diseases (diseases of the lungs) and is known for dubbing pneumonia the "old man's friend." Ironically, Osler himself died of pneumonia after contracting influenza. How Do People Know They Have Pneumonia? Depending on the cause of the pneumonia and the health of the person with the infection, its symptoms can vary. Symptoms of bacterial pneumonia may appear suddenly and include high fever, chills, rapid breathing, a deep cough that brings up greenish mucus that is sometimes mixed with blood, and severe chest pain that worsens with breathing and coughing. A persistent dry cough, sore throat, and skin rash mark mycoplasma pneumonia (walking pneumonia). These chest X rays compare clear, healthy lungs with the cloudy, inflamed lung tissue of pneumonia. Viral pneumonia can produce symptoms similar to those of the flu, including fever, muscle aches, breathlessness, rapid breathing, and a dry cough, which can worsen and eventually bring up a small amount of mucus. Other symptoms that may accompany both bacterial and viral pneumonia include loss of appetite, nausea (NAW-zee-uh), vomiting, headache, and excessive sweating. In people with weakened immune systems, pneumonia can quickly become worse. How Do Doctors Diagnose and Treat Pneumonia? To identify the infection, the doctor first takes a history of the patient's symptoms and then will listen to a patient's chest with a stethoscope. Fluid in the lungs often produces a crackling sound when a person breathes, which can point to pneumonia. Sometimes the doctor will not be able to hear any air moving through the affected part of the lung. 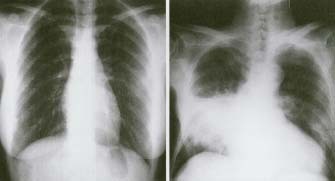 Chest X rays also may be taken, and a cloudy, dense-appearing area may be seen in one or both lungs, particularly in a person who has bacterial pneumonia. Next, the doctor may take samples of blood and sputum (SPYOO-tum, coughed-up mucus) to try to find out what is causing the pneumonia. These samples can be examined under a microscope and sent to the lab for culture * and identification of the organism causing the infection. In severe cases, a bronchoscopy * or a lung biopsy * may be performed. * bronchoscopy (brong-KOS-kopee) is a procedure used to examine the bronchi, the major air passages in the lungs, with an instrument called a bronchoscope, which is a tool for looking inside the lungs that is made up of a lighted tube with viewing lenses. Antibiotics are used to treat bacterial pneumonia. Antiviral or antifungal medicines are prescribed in some cases of viral or fungal illness. In severe cases, patients may need to be hospitalized, particularly if they are in danger of dehydration * , need more oxygen, or cannot breathe well enough on their own. With treatment, bacterial pneumonia symptoms usually improve within a day or two and are gone in 1 to 2 weeks, but symptoms of viral pneumonia and mycoplasma pneumonia can last longer. In severe cases, respiratory failure (the inability to breathe adequately) can occur, requiring the person to be hospitalized and placed on a ventilator for breathing assistance. Pus * can collect in the spaces surrounding the lungs and may need to be drained surgically. The lungs also can become scarred, leading to long-term breathing problems. These complications, particularly when they affect elderly people or patients with other health problems, can ultimately lead to death. The pneumococcal (nu-moh-KAH-kal) vaccine * works well against pneumococcal bacteria that cause pneumonia and is recommended for people over age 65 and children under age 2 years, those with certain other illnesses, or those with weakened immune systems. The vaccine typically needs to be given only once in a lifetime. Yearly flu vaccines can help prevent pneumonia caused by influenza viruses. Because pneumonia often is caused by contagious respiratory infections, people can protect themselves further by avoiding being near people who are sick, hand washing, not touching used tissues, and never sharing food, drinks, or eating utensils. The American Lung Association, 61 Broadway, 6th Floor, New York, NY 10006. The American Lung Association offers information about pneumonia on its website. U.S. Centers for Disease Control and Prevention (CDC), 1600 Clifton Road, Atlanta, GA 30333. The CDC is the U.S. government authority for information about infectious and other diseases. It provides information about pneumonia at its website. KidsHealth.org . KidsHealth is a website created by the medical experts of the Nemours Foundation and is devoted to issues of children's health. It contains articles on a variety of health topics, including pneumonia.